After a bad case of pneumonia which required surgery to drain the infection and a week long hospital stay, my Mom is finally out of the hospital. It will be many weeks before she is back to her old self, so she is staying with my sister is Missouri. I went down to the hospital in Columbia, Missouri, last weekend, and stayed with her until she was released on Thursday. I dropped her off at my sister’s, and then headed home late Thursday evening. It was so good to get home to Harland, Kitty, and Muffy. 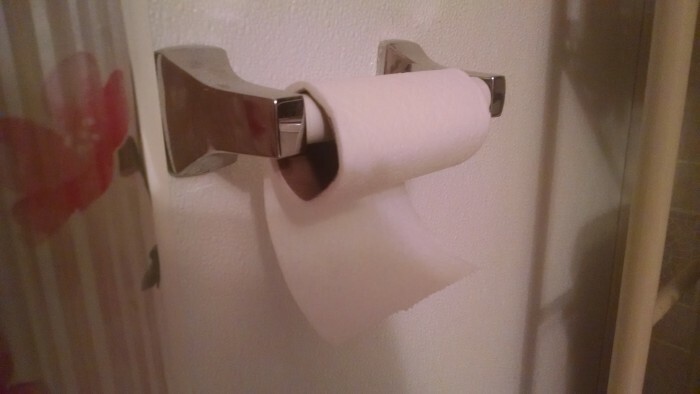 But toliet and paper towel rolls were soon turned the correct way and all was well. Thank you for all your prayers and good wishes. They mean a lot to me and my Mom. I’ll be back soon with updates on both Daisy and Donald, plus other doings here on the farm.